As the UK markets start to show signs of recovery, how will businesses and individuals prepare themselves for growth, and more importantly where will we look for our future competitive advantage? One business process that has gained credibility throughout the recession is Lean Manufacturing. Responsible for the slimming down of a sector that was once ‘eating for two’, how do we continue on with these successes? One possible solution would be to accredit the engineers and process operators (the backbone of the manufacturing industry whom have muddled us through recession – burdened with cost reduction frenzies) with formal recognition and qualifications. KCTS has recently launched a new Lean Qualification that offers a range of continuous improvement skills to employees within production, quality and engineering roles. The qualification is made up of a number of units, the selection of which can be tailored to the needs of the employers overall Lean Programme and the candidate’s personal job role. • Gathering data history for loss and waste. • Conducting a 5S audit of a work area. • Creation of a plan to solve losses and improve a work area (5S). • Training out new SOP’s to colleagues. • Following a Plan, Do, Check, Act, methodology. • Sustaining improvement for a period of at least one month. • Reporting of actual benefits gained by the improvements. • Portfolio of evidence that demonstrates a lean process has been followed. Candidates are assessed and guided every two to three weeks and always work to an action plan. Encouragement is given to communicate findings and potential solutions with front line managers. • Recognising potential hazards in the workplace and knowing what procedures to follow in an emergency. • Establishing and maintaining effective working relationships. • Communicating effectively in the workplace. • Understanding the principles and benefits of the 5S and Kaizen approaches to continuous improvement. 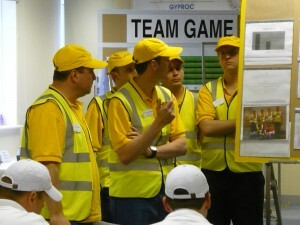 • Carrying out visual management activities in the workplace. • Identifying potential problems and using appropriate problem solving technique to tackle them. A Lean Qualification shows that an employee has reached a recognised national standard in Continuous Improvement methodology. • An overall shift in culture towards one that supports reduced losses, reduced costs and increased customer satisfaction. • Employees who feel empowered to make their work place better. • Employees who see their job as more than just “turn up every day”. • A group of employees who have been leading change rather than being unwitting participants. • In the most part financially better off than cost neutral, and even more so in those cases where improvements are sustained. • Candidates directly involved with improvement projects are more likely to be involved with maintaining the results. Aimed at continuous improvement engineering/maintenance craft, process operators, quality personnel, supervisors and managers who are seeking to become qualified in Lean. This entry was posted on Thursday, March 4th, 2010 at 15:21	and is filed under TPM. You can follow any responses to this entry through the RSS 2.0 feed. You can leave a response, or trackback from your own site.